The Clovers (also known as Arasia Perdana) is a freehold residential development by Asia Green Group. It is strategically located within the established township of Sungai Ara, just a few minutes away from the Penang International Airport. It comprises 3 blocks of 42-storey condominium with a total of 892 residential units, 180 units of which are categorized under affordable housing. 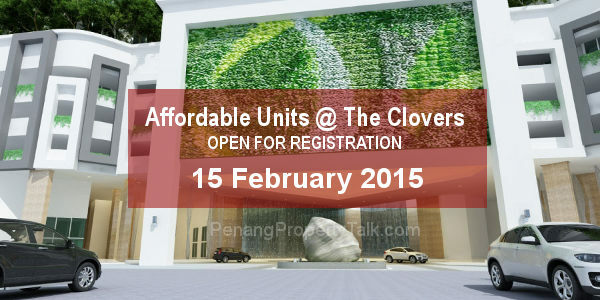 The registration for affordable units under The Clovers will be held at The Clovers Sales Gallery, Lengkok Merbah, Sungai Ara this Sunday, 15 February 2015. The smallest affordable unit starts from 699 sq.ft., with an indicative price from RM 200,000 onwards. No bad location in penang island…depand on your convenient. The clovers quite good for those who work around FIZ. There will be 2 schools coming up in future..the hold stretch of road will be upgraded to 3 lane both ways. Still available? for 400k affordable..
Pls add me in whatapps group as well. My email is winnielim_27@hotmail.com. Thank you! Is there any unit still available?? Any New project in Glugor, Jelutong or St Nibong? Is there any project opposite of tower B? Will there be flooded when raining? Hi, may i know is it still available? Can i have the brochure and price quotation? I am interested for affordable housing. Please do not hesitate to pm me. I am interested for clovers affordable house. Please, can I have more information?